Edition of the 10th Anniversary, FRUIT ATTRACTION 2018 which took place from Tuesday 23rd to Thursday 25th October broke records, consolidating its position as one of the main world events of the Fruits & Vegetables sector. 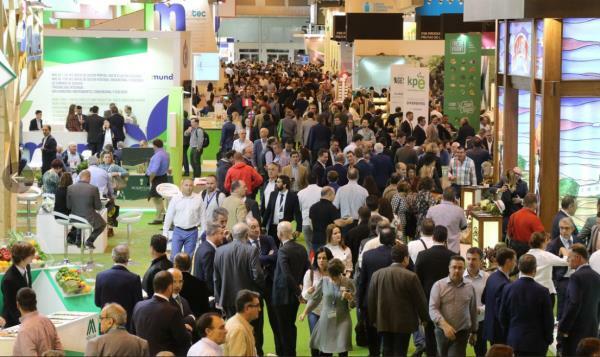 According to the organizers, IFEMA and FEPEX, the 2018 show exceeded all participation parameters with 81,235 trade visitors from 122 countries, representing a growth of 19% over the previous year, and with the participation of 1,621 companies from 40 countries, a growth of 11% and an exhibition area of ​​51,400 m2, 15% more than the previous edition. In terms of exhibitors, international participation accounted for 36% of the total, with 580 companies from 40 countries, coming from Europe, South America, Asia and Africa. Angola, the United Arab Emirates, Finland, India, Iran, Mali, Malta, Russia and Serbia participated for the first time at the show. The change in opening days (from Tuesday to Thursday, instead of Wednesday to Friday as in previous editions) was beneficial with a 69% increase in the number of visitors during the last day. These figures confirm the effectiveness of the extension of the activity to 3 full days, whose main objective is to maximize the commercial useful time of the event. The next edition of FRUIT ATTRACTION will take place from 22nd to 24th October 2019. FRUIT ATTRACTION 2018, this edition of the 10th anniversary was the most important (number of visitors, number of exhibitors, exhibition area, events) of the show's history.